One of the leading companies offering mounting systems for hand held devices is Ram Mounts. From cell-phone grips, to biger laptop setups, they offer an array of systems that will accommodate most of your needs when on the road. 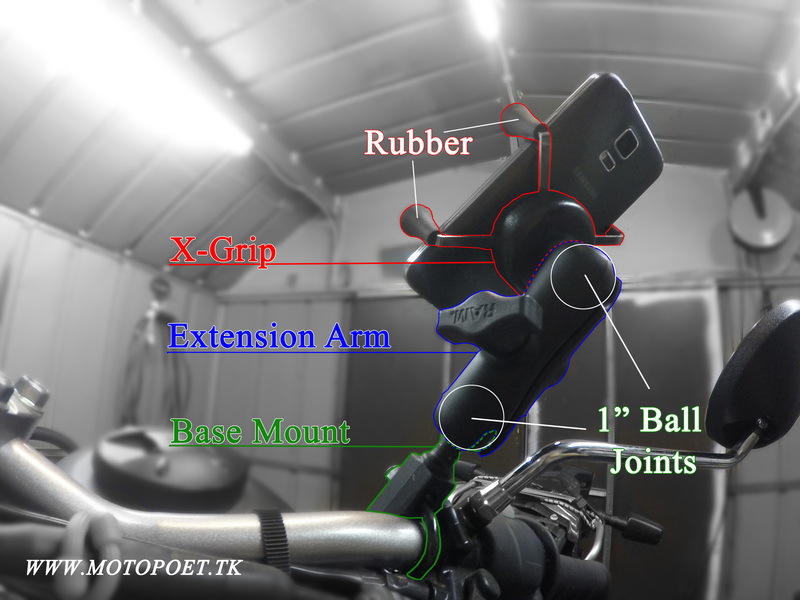 To use on my motorcycle I chose the X-Grip system for its overall versatility. This little gadget is a great addition to your bike, especially if you are a phone-ohollic like me (hey you, don’t text and ride). The system is made up of three main components: The X-Grip, which is connected to the base mount, using an extension arm, via 1″ rubber ball joints – a smart move since they aid in buffering engine vibrations. X-Grip Components (Front) – Click to enlarge. Your device is griped by 4 rubber corners that prevent scuff marks, combined with a strong x-spring system that clenches with enough force to withstand highway speeds of 75 MPH. Originally I put velcro stickers on my phone and the x-grip because I felt like my phone was going to fly away, but eventually I removed it to fit a new phone and so far I haven’t had any problems. One caveat is that the X part of the grip swivels a little (about ¼”) on the middle pivot point, having a locking mechanism would be great. The base mount comes in different configurations so you will have to see what best fits your bike before you order (See HERE), the one I have is a basic U-bolt bracket that wraps around the handlebars via bolts and lock nuts, making it very sturdy. What they all have in common is the 1” rubber ball that works as the joint between the different parts of the system. X-Grip Components, back view – Click to enlarge. When put together you have a mounting system that allows you to position your device exactly where you want it thanks to the two ball joints and extension arms. Once in place tighten the knob and you are good to go! 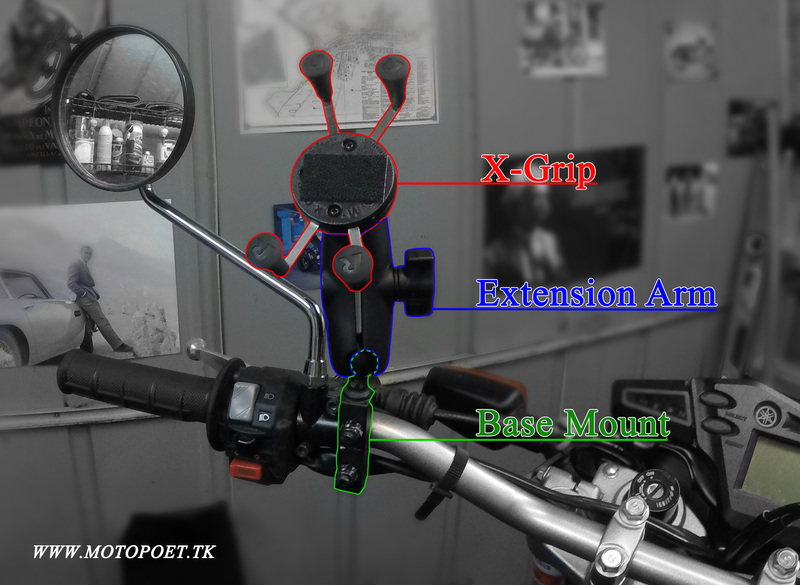 X-Grip System – Click to enlarge. Be sure to check out WWW.RAMMOUNT.COM to see what product configurations best fits your ride. Great pictures and detailed review, thanks for sharing !